People from across the nation are discovering the perks and benefits of serviced apartments in Brisbane. What's a serviced apartment, you say? It's the best of both worlds - a living space you can call home with the amenities and services of a five-star hotel. You can stay as long or as short as you want. Solo travellers, families and businessmen will appreciate the conveniences and comforts of furnished spaces when they choose a serviced apartment for their Brisbane accommodations. Corporate Keys is your company when it comes to quality corporate housing accommodation and affordable Brisbane short term rentals. Our luxury accommodations are custom-tailored for business travellers looking for a place to stay. Each apartment has been provisioned with care for the most comfortable short term housing Brisbane has to offer. Serviced apartments are more affordable. If you've spent some time traveling, then you'll know how accommodation can eat up a large part of your budget. People who prefer better value for their money can turn to a serviced apartment instead of booking a costly hotel room. Short term apartment options in Brisbane can get more privacy. After a long, hard day, you'd certainly want the room all to yourself. Serviced apartments can give you the much-needed privacy that you can't get in most hotels. Total freedom, complete privacy and having a larger space is not something hotel rooms can provide. Guests are never disturbed unless absolutely necessary. Brisbane serviced apartments have more space. Hotel rooms are cramped and they don't make you feel at home. With Brisbane accommodations, you get a fully-furnished bedroom with kitchen for cooking in and a living room for entertaining guests. Business travellers will find plenty of room on which to work in. Instead of working atop the hotel bed, you can get actual work done by sitting down at a table. Corporate Housing options in Brisbane give you additional savings. Staying at a hotel usually means you'll be shelling out money for essential services such as doing laundry or ordering food. These little charges can add up in a hurry if you're not careful. When you opt for a Brisbane serviced apartment, you won't have to worry about paying for laundry or reaching into your wallet each time you eat. You can enjoy a home-cooked meal in the apartment's provided kitchen. Putting together an effective itinerary is one way to make the most of your trip to Brisbane. Make sure to include leisure time for the most famous landmarks. You wouldn't want to miss out on what this great city has to offer, would you? Southbank Art Galleries and Queensland Performing Arts Center. Take on Australia's pride for a spin if you wish to experience art, creativity, ballet, opera or any other theatrical performances. The Cultural Center located right in South Bank, includes the Gallery of Modern Art and the Queensland Art Gallery in one fantastic package. You can also get a feel for Brisbane's history and cultural aspect by visiting the Queensland Museum. Suncorp Stadium.Sports enthusiasts must pay a pilgrimage to Queensland's premier outdoor sports venue. Aside from hosting soccer and rugby games, this 52,500-capable stadium regularly caters to concerts as well. Wheel of Brisbane.Get up high and see the marvelous sights and spectacular views Brisbane has to offer. The 60-meter high ride can be located in the South Bank. The Koala Sanctuary. See hundreds of koalas in the world's largest koala sanctuary. South Bank Parklands. There's plenty to do here. Eat in the many restaurants or take a slow, leisurely walk in tree-lined paths. The stunning beach has over 17 hectares of prime space with highlights such as swimming pools, barbecue and picnic spots, playgrounds and colorful gardens to explore. St. Helena Island.Take a ferry down to Queensland's first national park. See the ruins of a colonial prison that was known as the "South Pacific Hell Hole" at one point. Tourists gather round other major attractions such as the Story Bridge, the Lone Pine Koala Sanctuary, the Alma Park Zoo and Brisbane's very own cricket stadium, The Gabba. When you book executive rentals in Brisbane with Corporate Keys, you'll never be far from these visual delights. 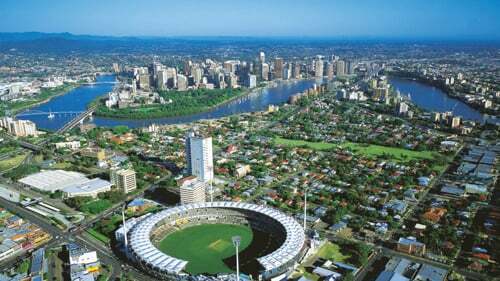 Brisbane, the capital city of Queensland is a bustling city with business men and women during the day. As such, it has an expansive array of options when it comes to meeting someone over a business deal. There's a number of notable restaurants near our Brisbane corporate housing, whether you're catching up with a work colleague, meeting with an important client or for hosting a company dinner. For dining with the best views, you can go to the Brasserie on the River or Pony Dining, located in Eagle St. Pier. If you want classy fine dining, then book a reservation at Il Centro, E'cco Bistro or the Customs House. Special occasions are made extra special when you go to Thyme2 or in Asana by Pete Evans. Finally, unwind and relax at the Regatta Boatshed or the Hatch & Co. In short, Brisbane has everything you need - cultural experiences, entertainment and history. You will have the chance to taste what Brisbane has to offer by staying through Corporate Keys. Both short and long stays are treated with the same quality of service, as we are committed to making your trip as pleasing as possible. Our short-stay accommodations are self-contained and fully furnished. They come with full kitchens, laundry facilities and Wi-Fi connections. Our Brisbane serviced apartments are twice the size of regular hotel rooms but they cost only half the price. This makes our apartments an excellent alternative for those who are planning to have an extended stay within Brisbane. If you're planning to visit Brisbane for more than 28 nights, then choose Corporate Keys and save on costs while getting the best living accommodations this side of Brisbane. Have you considered these Brisbane furnished apartment buildings? Have you considered these suburbs for Short and Long Stay Brisbane accommodation? Still not convinced? Click to read reviews from guests who have used our Brisbane accommodation solutions.